The Project Gutenberg eBook of The Histories, by Tacitus, translated by W. Hamilton Fyfe. Sir Henry Savile (a.d. 1591). I. The Fight for the Throne. June 9. Death of Nero. 16. Galba, Governor of Nearer Spain, declared Emperor at Clunia. October Galba enters Rome. Massacre of Marines at Mulvian Bridge. His government controlled by Laco, Vinius, and Icelus. January 1. News of mutiny in Upper Germany, now governed by Hordeonius Flaccus. 3. The armies of Upper Germany (under Caecina) and of Lower Germany (under Valens) salute Vitellius, Governor of Lower Germany, as Emperor. 10. Galba adopts Piso Licinianus as his successor. 15. Otho declared Emperor in Rome and recognized by Praetorian Guard. Murder of Galba, Vinius, and Piso. Otho recognized by the Senate. February The Vitellian armies are now marching on Italy: Caecina through Switzerland and over the Great St. Bernard with Legio XXI Rapax and detachments of IV Macedonica and XXII Primigenia: Valens through Gaul and over Mount Genèvre with Legio V Alaudae and detachments of I Italica, XV Primigenia, and XVI. 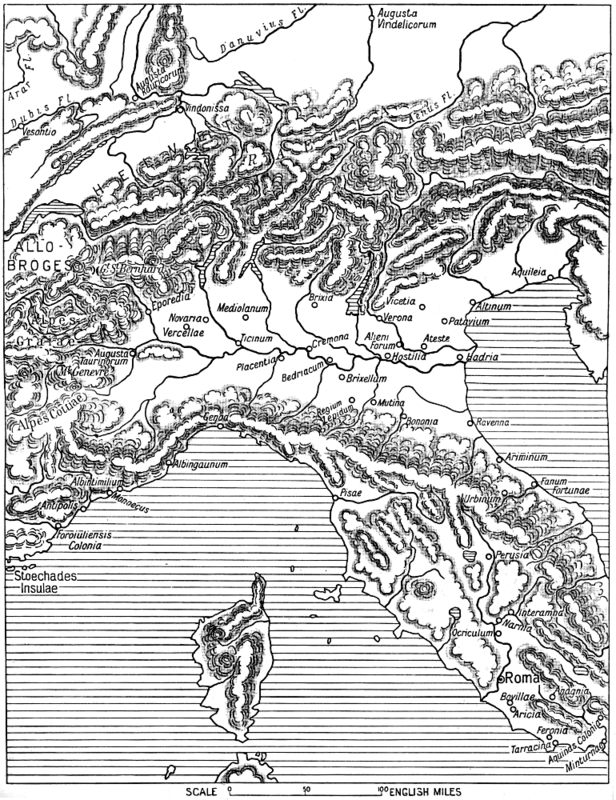 March Caecina crosses the Alps. Otho dispatches an advance-guard under Annius Gallus and Spurinna. Otho starts for the Po with Suetonius Paulinus, Marius Celsus, and Proculus. Titianus left in charge of Rome. Otho sends fleet to Narbonese Gaul, and orders Illyric Legions1 to concentrate at Aquileia. Spurinna repulses Caecina from Placentia. Otho's main army joins Gallus at Bedriacum. Titianus summoned to take nominal command. April 6. Battle of Locus Castorum. Caecina defeated. Valens joins Caecina at Cremona. 15. Battle of Bedriacum. Othonian defeat. 17. Otho commits suicide at Brixellum. 19. Vitellius recognized by the Senate. May Vitellius greeted by his own and Otho's generals at Lyons. 24. Vitellius visits the battle-field of Bedriacum. June Vitellius moves slowly towards Rome with a huge retinue. July 1. Vespasian, Governor of Judaea, proclaimed Emperor at Alexandria. The Eastern princes and the Illyric Legions2 declare for Vespasian. His chief supporters are Mucianus; Governor of Syria, Antonius Primus commanding Leg. VII Galbiana, and Cornelius Fuscus, Procurator of Pannonia. Mucianus moves slowly westward with Leg. VI Ferrata and detachments from the other Eastern legions. Vespasian holds Egypt, Rome's granary. Titus takes command in Judaea. Antonius Primus with Arrius Varus hurries forward into Italy. August Vitellius vegetates in Rome. Caecina marches to meet the invasion. (Valens aegrotat.) His Legions are I, IV Macedonica, XV Primigenia, XVI, V Alaudae, XXII Primigenia, I Italica, XXI Rapax, and detachments from Britain. September Antonius surprises a Vitellian detachment at Forum Alieni. At Padua the Pannonian legions arrive. He fortifies Verona. The Moesian legions arrive. Caecina holds Cremona with Legs. I Italica and XXI Rapax and cavalry. He encamps with the rest of his force near Hostilia on the Tartaro. 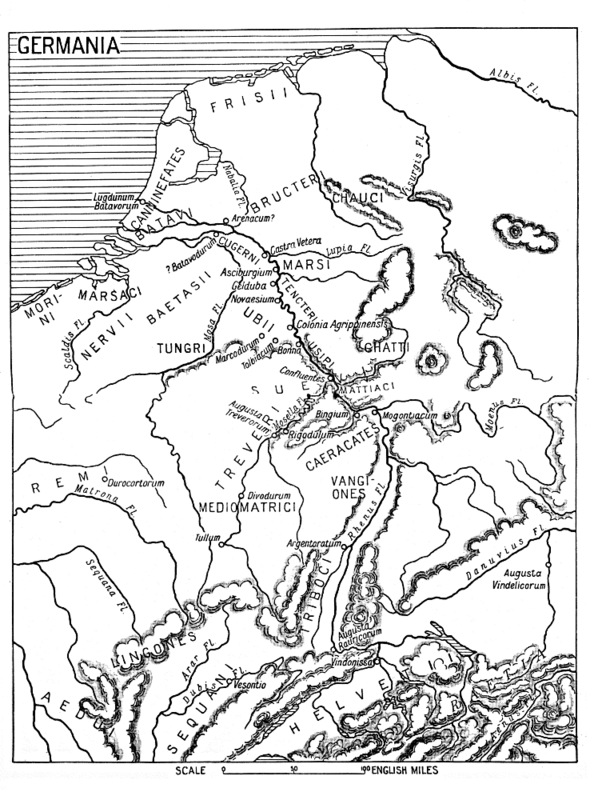 Valens dawdles northward with three praetorian cohorts. October The fleet at Ravenna declares for Vespasian. Caecina attempts treachery and is imprisoned by his army, which starts on a forced march to Cremona. Antonius starts from Verona to intercept them. 27. Second Battle of Bedriacum. Legs. I Italica and XXI Rapax sally from Cremona and are driven back by Antonius. The six legions from Hostilia reach Cremona. The united Vitellian army makes a night sally from Cremona and is defeated. November Valens, having reached Ariminum, flies to Monaco, and is captured in the Stoechades Islands. Spain, Gaul, and Britain declare for Vespasian. Antonius advances via Ariminum to Fanum Fortunae. Vitellius holds the Apennines at Mevania with fourteen praetorian cohorts, a new legion of marines, and cavalry. Mutiny of the fleet at Misenum. Tarracina seized. Vitellius returns to Rome with seven cohorts and part of the cavalry. The remaining cohorts are moved back from Mevania to Narnia. L. Vitellius with six cohorts and cavalry besieges Tarracina. 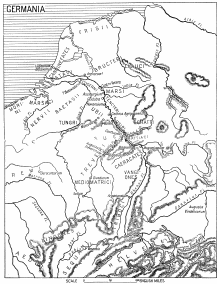 December Antonius crosses the Apennines and halts at Carsulae. Varus wins a cavalry skirmish at Interamna. Valens beheaded at Urbino: his head flung into camp at Narnia. Surrender of Vitellians at Narnia. Antonius marches as far as Ocriculum, sending Cerialis forward to Rome with 1,000 cavalry. 17. Vitellius, wishing to abdicate, is prevented by troops and mob. 18. They besiege Flavius Sabinus in the Capitol. 19. Capitol stormed. Temple of Jupiter burnt. 20. 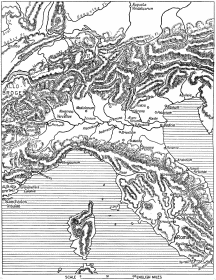 Cerialis defeated outside Rome. Antonius makes a forced march along Via Flaminia. 21. Capture of Rome. Murder of Vitellius. Domitian installed as 'Caesar'. January L. Vitellius surrenders in Campania. Mucianus arrives in Rome as regent. Autumn Revolt of Civilis and Batavians, at first ostensibly in support of Vespasian. Revolt supported by Canninefates, Frisii, Marsaci, Cugerni. Civilis routs Gallic auxiliaries and captures the Rhine flotilla in 'The Island'. Munius Lupercus advances from Vetera with remnant of Legs. V Alaudae and XV Primigenia, supported by Ubian, Treviran, and Batavian auxiliaries. Civilis drives him back into Vetera. The eight Batavian cohorts at Mainz march off to join Civilis, and defeat Leg. I Germanica at Bonn. Bructeri and Tencteri join revolt. Vocula advances to relieve Vetera with detachments of Legs. IV Macedonica, XXII Primigenia, and I Germanica. Vocula encamps at Gelduba. Flaccus makes head-quarters at Novaesium. Civilis' assault on Vetera repulsed. Vocula with difficulty repulses attack on Gelduba. Relief of Vetera. Vocula then retires to Novaesium. Civilis takes Gelduba and wins skirmish outside Novaesium. Mutiny in Novaesium. Flaccus murdered. Civilis renews blockade of Vetera. Chatti, Mattiaci, and Usipi threaten Mainz. Vocula relieves Mainz and winters there. January (?) Revolt of Gallic tribes, Ubii, Tungri, Treviri, Lingones, headed by Classicus, Tutor, and Sabinus. Vocula advances to save Vetera, but is driven back to Novaesium by mutiny of Gallic auxiliaries, and there murdered. His army swears allegiance to 'Empire of Gaul'. Tutor takes Cologne and Mainz. Vetera surrenders to Classicus. Garrison massacred. The Baetasii, Nervii, and Tungri join revolt. Spring Mucianus and Domitian start from Rome with reinforcements. Cerialis, with Legs. XXI Rapax and II Adjutrix, is to operate on Lower Rhine. Annius Gallus, with Legs. VII Claudia, VIII Augusta, XI Claudia, is to operate on Upper Rhine. The Sequani, still loyal, defeat Sabinus and Lingones. The Remi, also loyal, summon a Gallic Council, which votes for peace, but the Treviri and Lingones hold out under Classicus, Tutor, and Valentinus. The Roman mutineers return to their allegiance. Summer Sextilius Felix routs Tutor near Bingen. Cerialis defeats Valentinus and occupies Trier. The Germans surprise the Romans in Trier, but Cerialis drives them out and storms their camp. Massacre of Germans at Cologne. Cohort of Chauci and Frisii entrapped and burnt. Leg. XIV Gemina arrives from Britain and receives submission of Nervii and Tungri. Legs. I Adjutrix and VI Victrix arrive from Spain. Autumn Civilis defeats Cerialis near Vetera, but is routed on the next day and retires into The Island. Hard fighting on the Waal. Civilis retires northwards over the Rhine. Civilis makes overtures of peace. 1 i.e. in Pannonia Legs. VII Galbiana and XIII Gemina; in Dalmatia XI Claudia and XIV Gemina; in Moesia III Gallica, VII Claudia, VIII Augusta.